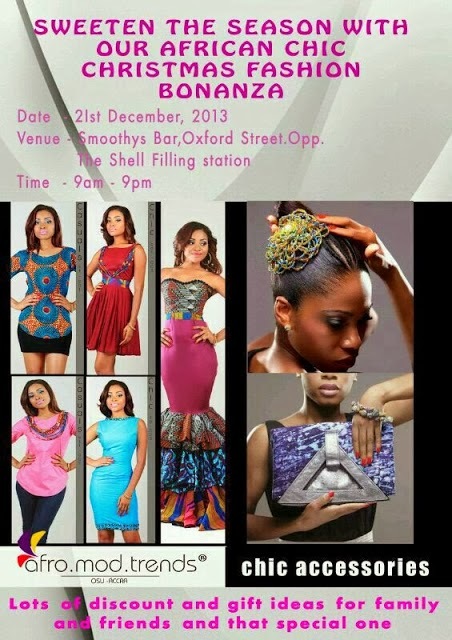 To make this festive season even more enjoyable for you,Ghanaian Fashion brand,Afro Mod Trends will hold a one day shopping bonanza on Saturday the 21st of December at Smoothys Bar near Papaye on the oxford street in Osu, from 9am to 9pm. There'll be massive discounts and several gift ideas for friends and family. Make it a point to pass by and and get amazing deals from one of Ghana's fastest rising fashion brands.